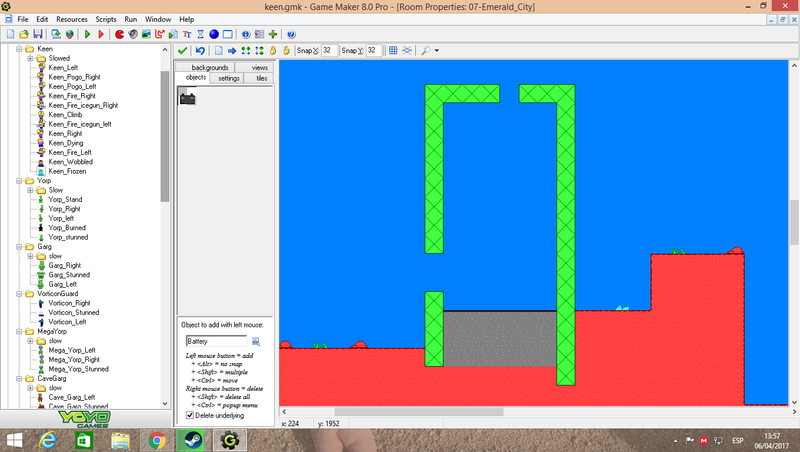 Hello there my friends from the PCKF, i have been programming a commander keen game with the gamemaker 8.0 engine, and then i get a good result. so, here's the game link, it's not completed yet, i only share it now because i want know your opinion and if you can give me some ideas and some of the things i should fix in this game. Take a look of my work. Last edited by IceDuck347 on Fri Apr 07, 2017 23:03, edited 4 times in total. I gave it a quick try and I thought: decent, has potential, movement is perhaps a bit slow. When moving forward it feels as if you're pushing against something (not sure if I'm describing it well, but I think it might be that the speed of horizontal movement doesn't quite feel like it fits with the speed of jumping and pogo-ing). Controls aren't quite intuitive - since A jumps and such, I'd expect a key near it to fire, but the spacebar fires. It might make more sense and be better for finger positioning on the keyboard if either firing was done with a key near A (D for example, or F) or jump and pogo were on Ctrl and Alt or similar. I found it odd that there's a key to activate the pogo and a different key to deactivate it, rather than the same key toggling it depending on whether you currently have it active or not. Keen's sprite is nice, has some charm. I hope that this post doesn't come off as overly critical, rather I mean to offer what could be some possible improvements since I think this has potential and it'd be cool to see it go further. Sorry if i answered late. (Very late) but i have been working on this game. Thanks for your post. I already have completed 80% of mars. When i complete it i will upload first full update of the game. I already found how to solve to be the same key that activates/deactivates the pogo. Hope you like the full game. OK, when will you release the new update? sorry if commander keen travels should not be done in that 3-6 days, but is almost complete, only need finish emerald city, another polar level, fix some dumb bugs, and release it. It has been 3-6 days now, hasn't it? yes, i'll tell you... i was on summer holidays (in case you don't know, in argentina decembrn, jaunary, february, and half march are holidays, so i supossed i can finish it on those days, but... you know... school started, and also i found a problem on the game, but i will release it soon, but first i want to know if you really want to see this proyect done or not. Cool project! I'd love to see it finished someday. It'll take lots of time and learning but if you want to see this finished, too, you have to stick with it. Maybe someday you'll be a game-making expert! I love making NPCs in game maker. Do you need any specific help on them? Okay, i will do my best finishing this. You can combine it with a check to see if keen.y is the same (or close) to get a nice "charge when close" effect. That's just a basic example though, is there any complex behavior you were thinking of?